Bastille Day is the French National Day and it falls on le quatorze juillet (the fourteenth of July)- exactly 10 days after Independence Day. In France, it is formally called La Fête Nationale (The National Celebration). I first knew of this event in my French textbook. It was introduced in one of the chapters on celebrations, festivals and important events such as au nouvel an, à Noël and a la Saint-Valentin. To sum it up, all these events all started and ended with a wide symphony of glorious food!! What’s a celebration without good food! 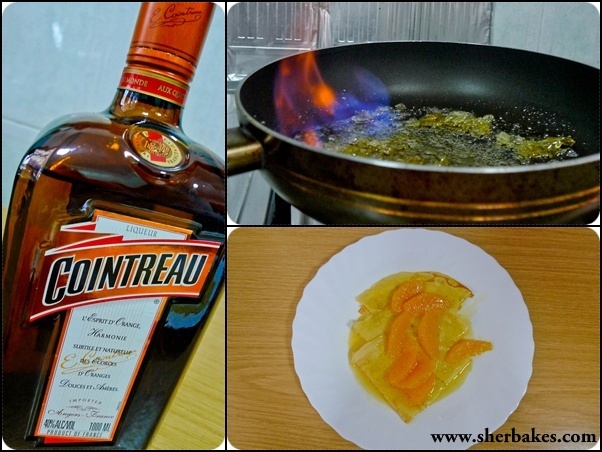 I’ve decided to prepare Crêpe Suzette on le jour de la prise de la Bastille! That dessert has been at the back of my mind since the day someone flambe the crepes infront of my eyes and so I can’t think of a better day to whip it up than on joyeux Quatorze Juillet. Crepes have long been regarded as a French staple for breakfast. There are many delicious variations- both savoury and sweet that one can enjoy a crepe. For me, I’m definitely hands down on sweet crepes. I love crepes with caramelized bananas, pralines, hazelnuts, berries, yogurt, maple beurre, chocolate. DAMN! How good they are! 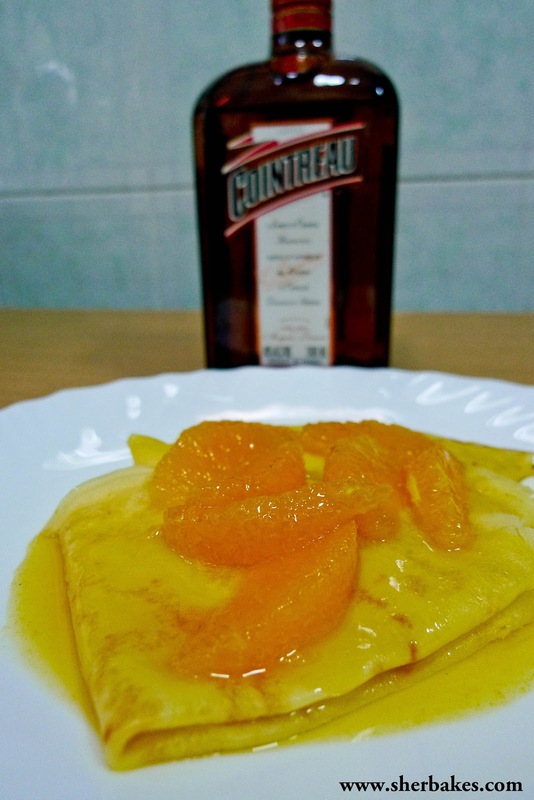 and of course one of my favourite is Crêpe Suzette- which is basically a crepe drenched with caramelized sugar, butter, orange juice, zest and grand Marnier/ Cointrea. The best “show” of this dish is when the Grand Marnier is added and flambé. This causes the excess alcohol to evaporate, leaving a fairly reduced caramelised orange sauce! As you can see in the picture below, the pan was tilted to the left so the flame only concentrated there. Sigh! It would have been more picture pretty if the entire pan lit up! Anyway Bon Appetite!! Made with Love: French Crepes with Reduced and flambé Orange Sauce and orange segments.